A fun, fresh, and practical guide for connecting with the wisdom of nature through spirit animals. Beastie [bee-stee]: The overarching spirit of any species of insect, reptile, bird, mammal, or mythical creature that exists or has ever existed; also known as an animal totem or spirit animal. "From an ancient perspective, everything—including all natural things, like rocks, flowers, trees, insects, birds, and mammals—is alive and infused with conscious energy or spirit," writes Sarah Seidelmann. If you're one of the many people looking to reconnect with the creativity, wisdom, and vital energy of the natural world, here is a fantastic guide for tapping into the power of animal totems, or "beasties." Beasties A–Z: an expansive compendium of individual beasties and their unique qualities—including bats, wolves, elephants, salmon . . . even unicorns and dragons! "A message brought by a beastie may be about beauty or family or work," teaches Sarah. "It might offer you guidance on a prickly problem. Or it might make you smile just when you need it." 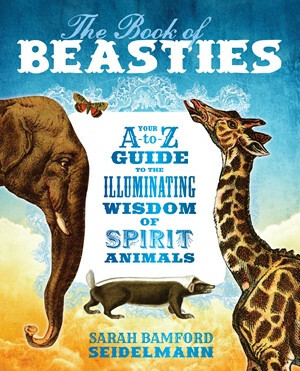 Whether you're a long-time shamanic practitioner or simply curious about what secret messages your favorite animal might have for you, The Book of Beasties is an ideal resource for discovering the wild and wonderful world of spirit animals.